Preliminaries to the 11th annual ATV/UTV Charity Ride kicked off this morning, with riders from throughout Langlade County joining members of the Kettle Moraine ATV Club and the Wisconsin ATV-UTV Association on an outing across northeastern Langlade County. The rite is actually three days of activities, with outings today and Friday leading into Saturday's main event and banquet, with proceeds earmarked to the Make-a-wish Foundation. Riders today assembled in the former Refuge parking lot and transported their machines to the Sherry Road trailhead for the day of riding. Activities include lunch at Lil' Hummer's in Pearson and dinner at Timber Haven in Polar. On Friday, there will also be a 9 a.m. ride with dinner at North Star Lanes. Registration for Saturday's ride will also begin from 5 to 7 p.m. at the lanes. Saturday's charity ride will open with registration at North Star from 7:30 to 8:45 a.m., followed by a driver's meeting and 9:15 a.m. departure. The ride will focus on the Crocker Hills and Augustyn Springs area, with lunch at Lil' Hummer's. The banquet will begin at 5 p.m. at North Star Lanes with raffles and drawings, including for three KLX-110 off-road motorcycles donated by Kawasaki and Verne's of Antigo. There will also ticket sales and silent auctions throughout the evening. one of the cycles donated to the charity ride this weekend by Verne's in Antigo. Event admission, including dinner, is $25 per person or $50 per couple. The public is welcome for the evening events, with free admission after 8 p.m. 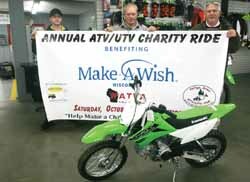 The charity ride came to Antigo in 2017, when it raised $27,000, enough to grant the wishes of five young people, including trips to Hawaii, Australia and the gift of an ATV. The event is drawing riders from across the state, with over 60 individual rooms booked at local lodging spots so far. And the charity has already been booked for 2019 in Antigo.